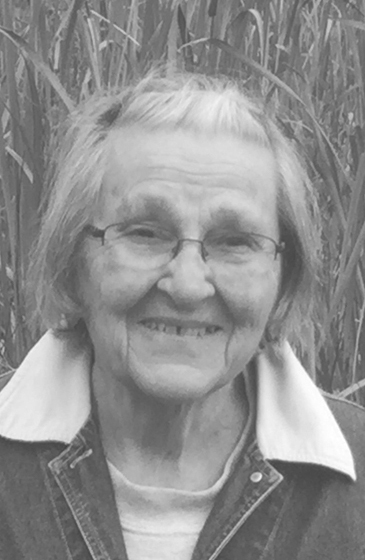 MUNISING, MI – Frances “Kewpie” Gage, age 93, passed away peacefully on the morning of November 8, 2018. She died surrounded by family at her home on St. Martins Hill, where she had lived for 65 years. She was born in Munising on October 24, 1925, to Albert and Lillian (Jarrett) Donathan. She was named Magdalen Frances after her mother’s best friend, Munising school teacher Magdalen (Lena) Frances Delger. Ms. Delger nicknamed her Kewpie because there were three children named Frances in the same class. Kewpie grew up in Munising, learned to swim in Lake Superior, but after her mother’s death, she moved to lower Michigan to live with an older sister and graduated from Montrose High School in 1945. Her best friend in Montrose was Eleanor Gage, who had a brother named Edgar. Kewpie and Edgar met on a blind date while he was home on leave from the Navy. They corresponded by mail until Edgar returned from his service in the South Pacific after World War II ended, and they were married on November 30, 1946. Kewpie and Edgar made their home in Munising where they raised six children and four adopted grandchildren. Motherhood was the focus of her life. In addition to mothering, Kewpie was well known for her exceptional swimming abilities. She credited her seventh grade physical education teacher, Madge Mayforth, for her interest in swimming. Ms. Mayforth taught her all the swimming strokes she needed to receive her Water Safety Instructor certification from the Michigan National Aquatics School on June 15, 1960. This led to her first job as a Waterfront Director at the Timber Trail Scout Camp under the direction of Earlene Ingraham. She subsequently served as swimming instructor at numerous Girl and Boy Scout camps, 4-H camps, and various church and youth camps. She also led a two-week Wilderness Survival Skills trip through the Sylvania Tract Wilderness. In the 1960s and 1970s, Kewpie worked as a substitute gym and pool teacher at Mather School and after school hours she taught swimming to students from Eben and Trenary, as well as adults. She also taught swimming for the Native American Education program and provided aquatic therapy for Munising children with disabilities. In 1990, Kewpie was named to the Girl Scout Hall of Fame and in 1998, she was named to the Alger County Women’s Roll of Honor. She volunteered at the St. Vincent De Paul store for many years before it closed and earlier this year she volunteered at the Commission on Aging for a couple months before she became too ill to serve. Kewpie is survived by her husband of 72 years, Edgar Erie Gage; sons Brady (Keely) Gage of Euharlee, GA, John Gage of Idaho, Chet (Jamie) Gage of Munising; daughters Micki (Dale) Sarasin of Gladstone, MI, Teri (Paul Taylor) Gage of Bayfield, WI, and Sabrina Gage of Phoenix, AZ; daughters-in-law Trish Gage of Brainerd, MN, Linda Greenwood of Warner Robins, GA, and Linda Webb of Cornelia, GA; 18 grandchildren, 14 great grandchildren, and one great great grandchild; sister-in-law Eleanor Shaw of Arizona. She was preceded in death by her parents; sons Michael Anthony, Gary Lee, Chet Alva, Sr., and David Allen; sisters Margaret (Jay) Spielmacher, Dorothy (Norm) Skagerberg, Irene (Ervin) Cady, and Annabelle (Blaine) Short; brothers John, Albert, and George Donathan; parents-in-law Sidney and Verna Gage; brothers-in-law Emerson and Earl Gage; and sisters-in-law Elaine Gage and Elizabeth Barton. The family wishes to thank everyone who sent cards, brought food, and spent time with Kewpie while she was ill, especially Ken and Fran Chaltry, Rod Des Jardins, Rachelle Hannah, Diane and Barry Hoover, Norma Harger, Terry Bower, Mike and Donna Lepovski, and the caring staff of Northwoods Hospice. In lieu of flowers, the family requests that donations be made in Kewpie’s memory to the Nancy Golisek Beauchaine Foundation at 1232 West State Highway M-28, Munising, MI 49862.